The Microsoft Language Portal has been redesigned and made easier-to-use. This exercise has been carried out as a part of a wider effort to provide IT terminology for public download in an industry-recognized format. 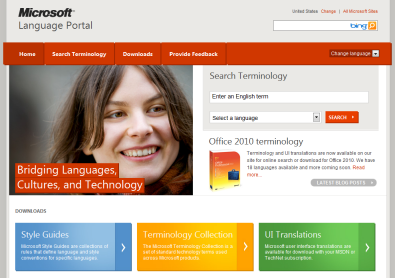 If you are a regular visitor to the Language Portal, you’ll still find our online terminology and UI strings search, style guide downloads, and UI string downloads for TechNet/MSDN subscribers, but Microsoft has also introduced a brand-new feature: public downloads of the international Terminology Collection in the industry-standard .tbx format. The Microsoft Language Portal also offers free downloads of localization style guides, a feedback feature to provide input on how Microsoft products are translated into your language, and much more. You can search for all the available Windows 7 & Office 2010 localized languages packs / LIP’s here on the Microsoft Language Portal.